Harpie Perfumer finishes off Harpie week on Pojo and is the twin support to Harpie Oracle. Same Harpie Lady copy effect as Oracle and others, Perfumer gets you a spell/trap that specifies Harpie Lady Sisters in the text. While Perfumer doesn’t get a Special Summon from your hand like Oracle, she can add another card with a different name from her first effect if you have a Level 5 or higher Harpie on the field. You get at least an add to your hand and don’t need to wait for the End Phase like with Oracle (as well as the card having to be in the grave first with Oracle). The immediate add combined without having the card in the grave when resolving the effect makes Perfumer a better choice than Oracle. You likely won’t get the second add to your hand, as there are only two monsters in the archetype that can be run to facilitate this. If you can change a Harpie of yours to Level 5 then this effect could be resolved much easier, with many of the Harpie monsters being Level 4, but that would mean having an effect solely dedicated to Perfumer and Oracle, which isn’t practical. Perfumer and Oracle adding cards back to the hand or to the hand is great for the archetype. These monsters should be run depending on how many of the available cards they search are run in the deck. I was going to end the week with a boss monster every week, but Harpies didn’t really get a boss monster (though a Harpie Lady Sisters retrain could of been a good card to have) so instead I’ll go with the Ultra Rare monster the archetype got, Harpie Perfumer. Harpie Perfumer is a Level 4 WIND Winged Beast with 1400 ATK and 1300 DEF. ATK and DEF are swapped from earlier this week but it really doesn’t matter if it was swapped or not since 1400 and 1300 aren’t too impressive, WIND is an attribute I’d love to see get better, and Winged Beast is already pretty good. 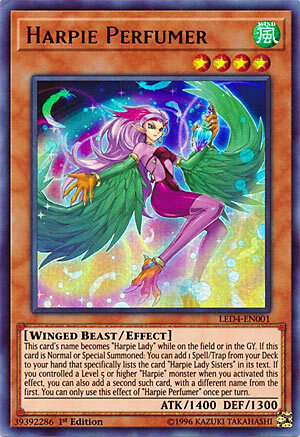 This card’s name becomes Harpie Lady while on the field or in the GY, very standard for Harpie monsters and you like to see that on these cards. If this card is Normal or Special Summoned, you can add 1 Spell or Trap that lists Harpie Lady Sisters in the text from your deck to your hand. Just as I said earlier that there were good cards to retrieve back with Harpie Oracle, there are great cards to search with Harpie Perfumer. Harpies’ Hunting Ground is already searchable by Harpie Queen so no need there, Alluring Mirror Split is a nice card to make your Harpies float, Harpies’ Feather Rest can help recycle your Harpies in the GY into the deck for some draw power, Harpie Lady Elegance will likely only be searched to pop it with Hunting Ground if you can and get a monster search instead, and Elegant Egotist can get a monster from your deck, but you’d prefer to search that with Hysteric Sign. If you control a Level 5 or higher Harpie monster you can instead search for two cards with different names that list Harpie Lady Sisters in the text. A plus two is great, but the way you’d probably be getting a Level 5 or higher Harpie on the field is Normal Summoning Channeler to discard and summon Harpies’ Pet Dragon or summoning a Harpie to use Elegant Egotist to summon Harpie Lady Sisters from your deck, so you would already use your Normal Summon meaning the second effect will be most useful in later turns with an already established board, even though there is a chance you would of already used Harpies’ Pet Dragon or Harpie Lady Sisters for a summon if they haven’t been destroyed already. You can Special Summon Perfumer with Hysteric Party while you got a high level Harpie for that double search, which is a good option. Most of the time, though, you’d probably be only searching for one card, which is still not bad at all considering searching without any restrictions afterwards is really good, even in 2019. This effect of Perfumer is a hard once per turn so you can’t search Elegant Egotist with a Perfumer for Harpie Lady Sisters and then Special Summon another Perfumer via some means. Still, Perfumer might be the best card from the Harpie support since it gets you to some pretty good Spells and Traps, run 3. Art: 4.25/5 She is very gorgeous, I like the pink outfit and green wings. Happy February! closing the week is Harpie Perfumer, who is still a Harpie Lady variant, though she has 1400/1300 attack and defense instead of the standard 1300/1400. Such a switch is essentially a moot point but it’s a difference nonetheless. So, we have another Harpie card treated as Harpie Lady when she’s on the Field or in your Graveyard. I’ve said all week this I like synergy in a Deck, but I don’t like forced synergy, and this card FORCES you to run Harpie Lady Sisters. I still see that as a disadvantage, despite the new support, even some being for her, it’s just not worthy enough to be using in a Harpie build. This fetches you a Magic/Trap that specifically states the Sisters (and ONLY the Sisters) from your Deck to your Hand. If you control a Level 5 or higher Harpier Monster (so a Pet Dragon, or God forbid, you have MORE THAN ONE Sisters in your Deck, yuck) you can retrieve a second Magic/Trap (differently named, still specific to the Sisters) from your Deck to your Hand. It can be a plus two in advantage, but much like we looked at with Elegance, it’s not really much of advantage. If you take, say, Elegant Egotist, say maybe because you have the Sisters in Hand, (though remember, it can fetch the Sisters from the Deck also) you’re fetching one card to bring out such a paltry card in Sisters, and not gaining advantage from that. You have to be set up well enough to have that other Level 5 or higher Monster out as well to net the second card, which is doable, but more or less a waste if not. Art: 4/5 She’s very pretty, almost gives me a fairy vibe with all the colors in the background. I do rather like the dark on top transitioning into all the bright colors on the bottom half of the card.